Telangana Rashtra Samiti floor leader in the Lok Sabha, AP Jithender Reddy, said that such a synchronised exercise will cut costs, save time and ensure governments focus on development. "We are for it," Mr Reddy told PTI. Hyderabad: The ruling TRS in Telangana is on board with the BJP on the issue of simultaneous polls to Lok Sabha and state assemblies, a senior party leader has said. "It will give us time to focus on administration for five years, instead of every time going to elections," he said. "It will save money and time; you can focus yourself on the development of the state," the Lok Sabha member from Mahbubnagar said. On January 29, President Ram Nath Kovind had called for a "sustained debate" on holding simultaneous polls, saying all parties need to reach a consensus on the issue. In his maiden address to the joint sitting of the two houses of Parliament at the beginning of the Budget session, Mr Kovind said citizens alive to the state of governance in the country were concerned about frequent elections in one part of the country or another, which adversely impacted the economy and development. His remarks came days after Prime Minister Narendra Modi made a fresh pitch for holding the polls together. PM Modi had said that like festivals, elections should be held on fixed dates so that governments can function for five years. He also said that barbs exchanged during campaigning in one state have a bearing in other parts of the country which were not going to polls. 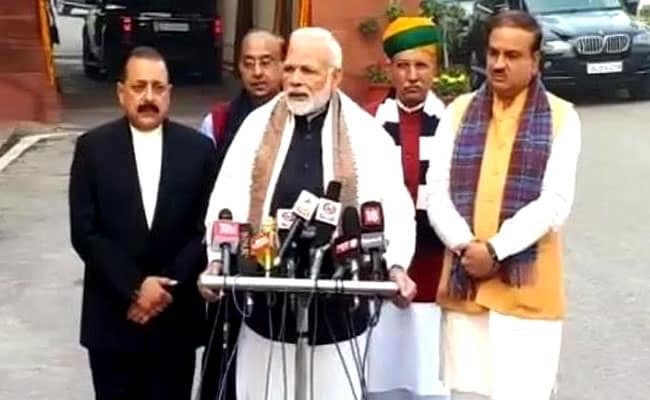 PM Modi was of the view that once the elections are held together, the central and the state governments can devote the next five years to governance.